As the first full week in February ends, the overwhelming temptation for political pundits is to compare the chaotic process of getting the Republican primary elections voters to choose the man who is ultimately going to get the nomination to Bach’s Little Harmonic Labyrinth, and so the World’s Laziest Journalist will skip that because it is too obvious. The executives for the Democratic Party know who their nominee will be just as surely as Karl Rove knows who his party will select. Isn’t it obvious to non pundits that Romney is a Potemkin candidate? For most Republicans the situation is like when they learn beforehand that they will be honored via a surprise party and that they will have to act surprised when it happens right on schedule. Didn’t Republicans fight hard to get ranked choice voting established and now aren’t they using the Liberals’ arguments against the change to discredit Romney who isn’t getting much more than about 50 percent of the voters in any one primary? Speaking of Republican inconsistencies; what about the possibility of sending Americans into Syria to help them win freedom and democracy? Is it an oxymoron when Republicans staunchly endorse sending American youth to die in a war to establish a democracy overseas? Shouldn’t they want to establish a Republic and not a Democracy? The Oakland city council at their regular Tuesday night meeting voted down a measure to order the Police to use more stringent measures when dealing with the Occupy protesters. Some cynics question spending money for keeping people out of a public park or plaza or from seizing a vacant building on a weekend when five murders are committed in other areas of Oakland. Isn’t the answer that there is always going to be gang violence but cleaning up the downtown shopping area makes business associations happy? Periodically at Frank Ogawa Plaza tiny teepees will appear. Apparently they are meant to be a gesture of defiance regarding the ban on the use of tents in that area in front of the Oakland City Hall. This week the Guardian weekly newspaper in San Francisco ran an article, on page nine of the February 8 to 14, 2012 edition, written b Shawn Gaynor, about new legislation which is designed to prevent the San Francisco Police Department from working with the FBI to investigate local citizens. Isn’t it one thing for the police to tell a fearful wife that they can’t do much about a husband’s threats until he actually does something unlawful, and another thing for a country that might send troops to Syria to investigate the possibility of future reprisals inside the USA? This week the New York Times in a lead story on page one reported that the USA plans to downsize the number of diplomats stationed in Iraq. Were they trying to hint that the massive Embassy constructed under war conditions in that country was an example of overspending that precipitated the numerous cuts to welfare programs inside the USA? If that’s what they wanted to imply, why not just come out and say so in an editorial? How can it be that there isn’t a week that goes by without some liberals protesting the treatment of prisoners in Guantanamo Prison but the allegations of prisoner abuse in the Los Angeles County Jail gets little (if any) notice outside that gigantic county? On Thursday, February 9, 2012, Occupy Cal held a rally on the Mario Savio steps at Sproul Hall. The World’s Laziest Journalist went early to the noon event and, while waiting for the start time to arrive, chatted with a local political activist, Russell Bates, who attends many of the political events in the area. Bates (who emphasizes that he is not related to the mayor of Berkeley) related a version of the events in Oakland on January 28, 2012, that didn’t quite mesh with the way it was reported in local news media. According to Bates, the marchers who trampled a fence down at the Kaiser Center in Oakland that day were trying to move away from police aggressive police officers and when the marchers encountered the fences the crowd movement away from the police was a greater force than the fence was engineered to withstand. Bates went on to assert that the people who were arrested for burglary entry into the YMCA later that night, were merely trying to avoid being arrested in a kettling maneuver by the police and that the marchers were merely rushing through the only avenue of escape. Bates alleges that of the 408 people arrested that day, only twelve were charged. Bates claims that the news media is complicit in spinning the events of that day because they did not provide aerial coverage from their news choppers of the kettling process. On Thursday, news coverage of the attempt to restart the Occupy Cal movement initially could be described as meager. A camera man from KTVU was covering the noon rally as well as reporters from the student newspaper, radio and TV studio. 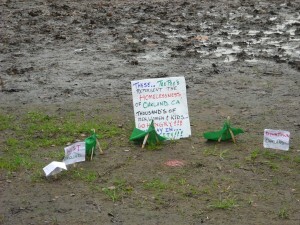 Last fall Occupy Cal received news coverage from a much larger contingent of journalists. A police officer informed the protesters that the tents they were erecting on Thursday afternoon were not permitted. The police did not take action immediately and attempts to learn about subsequent developments by listening for news reports on KCBS news radio were unproductive. The columnist functions as the writer, typesetter, editor, fact checker, for this column but also has to do the computer work necessary (download from the Coolpix, edit the photos and transfer the ones selected for possible use to a memory stick and then posted online in a place where the html process can find and fetch it for use when the column is posted on Friday morning) to add photos to the column. 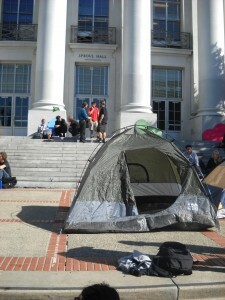 Would it be appropriate if the World’s Laziest Journalist were to be well paid to not cover Occupy Cal? How can “hush money” be spun so that it sounds commendable? On Friday morning, KCBS news radio was not making any mention of the Thursday student protest and so the World’s Laziest Journalist will have to take a circuitous rout to the computer which will be used to post the column online and check to see if the tents are still making their mute protest or if the protesters have folded their tents and faded away into the night. On Friday morning, that news station was reporting about a Thursday night public meeting in Oakland where members of the public made charges of police brutality against the participants in the Occupy Oakland events. Recently this columnist has suggested that there might be a need for an unofficial meeting place for a Berkeley Press Club. Apparently the columnist misjudged the level of enthusiasm such a suggestion might generate. Only one reader responded to the idea of such a group. 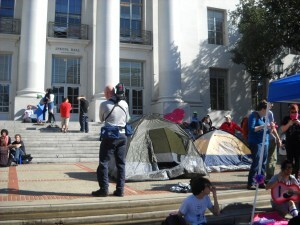 On Thursday, the news media seems to regard Occupy Cal as a fad that has faded. This just in: On Friday morning the tents were still on Sproul Plaza and more TV news crews had arrived and interviews were being conducted. The story on Friday morning seemed to focus on the symbolism of a mushroom as indicating regeneration. The World’s Laziest Journalist will try to file updates next week. Now the disk jockey will celebrate the Beach Boys reunion by playing their “Smile” album. Tuesday in San Francisco there will be several events to mark the 50th anniversary for Tony Bennett’s original studio session for making the recording of “I left my heart in San Francisco,” so the DJ will play that song. He will also play “Desert Caravan.” We have to go and see if we can watch the Grammies. Have a “nothing to see here” type week.